1. Set the mode selection switch to the or position. When you select or position, the system automatically turns on the outside (fresh) air mode. 2. Set the temperature control knob to the desired position. 3. Set the fan speed control knob to any desired speed except “0”. 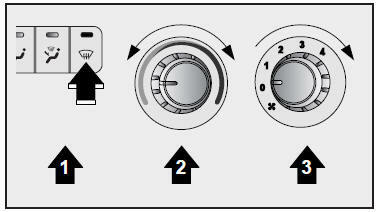 For maximum defogging, set the fan speed control knob to the “3” or “4” position.